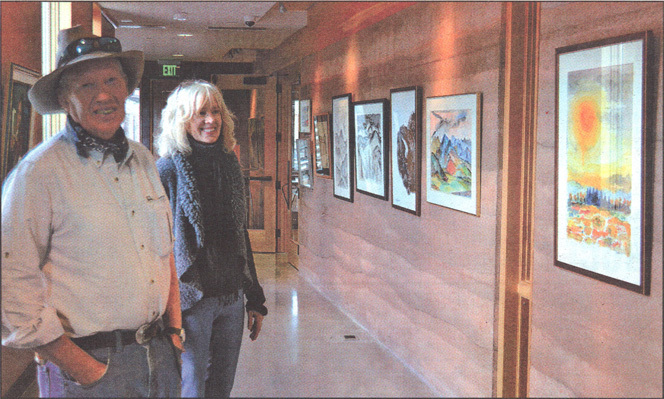 PINEDALE, WY – Seeing Kenny and Antonie Becker stand together and look at their father's paintings and pen and ink sketches is like seeing two more original Becker artworks. Antonie, an actress, who has lived around the world, is dressed, mainly in elegant New York black and silver. Younger brother Kenny, once a zoology student who lives in Pinedale, feeds neighborhood deer and wild birds and catches snowmelt off his roof into a row of buckets. Both love the outdoors, both sketch and paint, and both recall an exuberant and tumultuous life of living with a father whose work served him well but whose passion was painting. 'Kenneth Perrin Becker, 1913 – 1972' opened with a reception Thursday night in the gallery hall of the Sublette County Library in Pinedale and will be displayed through April. Kenneth Perrin Becker was born in a Chicago suburb in 1913 and from a young age, carried a sketchbook with him. He filled volumes with studies done in watercolors, pen and ink, and ink washes, which could stand on their own as separate original pieces. As a child, Becker Sr. suffered from asthma and his father took him on many desert trips to Encampment, Wyo., New Mexico, Arizona and Colorado ' for the arid climate as much as the landscape, according to Antonie. Becker also filled sketchbooks when he traveled with his partents to Haiti, Guatemala and Columbia. 'He traveled the New World, ' Kenny explained. These sketchbooks Kenny has 'kept intact, ' along with many paintings and drawings he stored after their father's death, and Antonie too kept boxes of his sketchbooks and flat–filed paintings. A prolific artist who was influenced by others but developed his own style, he was probably most content with life while he was painting and loved to give his artworks – almost exclusively landscapes – to people who admired them. Some of his paintings displayed on the library's earthy walls show a ferocity of energy with lines scratching through dark storm clouds. Othere reveal softer meditative curves and washes of color – sometimes as a very subtle highlight in an otherwise black and white piece, sometimes with the color replacing inked details completely. Although Becker's passion was painting, his father needed his help at the Ketterlinus Lithographic Manufacturing Co. in Chicago. He always had a studio, according to Antonie and Kenny. And he always gathered people to him, they recalled. 'He was a social animal, ' Kenny said of his father. In the 1940's, he became friends with Walter Paepcke, the man who would start Aspen's ski resort industry on another influential mountain landscape,' Antonie said. Their father's social life eventually overwhelmed him and led to his death at 59. The Art Institue of Chicago purchased four paintings for its permanent collection and until now, his work has not been displayed. This year marks 50 years since his first 'proper exhibit,' Antonie said. For more information abouth the life and art of Kenneth Perrin Becker, visit http://kennethperrinbecker.com. "The Carl Schurz Foundation with quarters in the Old Custom House presents a series of excellent watercolors by Kenneth Becker that catch the feeling of the rugged country around Aspen, Colorado. An intelligent as well as emotional painter, Becker offers a character study of a portion of the West not far removed from the pioneer to have lost touch with a frontier spirit. Watercolors of Victorian dwellings and ramshackle saloons contrast with the magnificence of towering mountain forms that reach to the clouds and spill down to the valleys (Razor Back and Above a Maroon Lake)." "Kenneth Becker has an unusually interesting and attractive exhibit of drawings of old houses of the Middle West on the first floor of the Art Institute. There are 41 works and each is worth study. Mr. Becker has read personality and atmosphere into these ancient buildings, and the years seem to slide through our fingers as the bits of history he has collected catch our eye, hold us, then give place to the next engaging scrap of Americana. The drawings are honest, straightforward, unadorned and sincere." "K.P. Becker's 'Drinking Scene' is a sophisticated and penetrating comment, executed with remarkable economy of effort." "Becker's work is drawn with unhesitating, sensitive, moving lines, clean and even in tone." "Another breath of fresh air from Kenneth Becker with his delicate "Gothic Tower in Aspen", this a sniff from a lavender sachet." "Mr. Becker is young to have received the recognition given his work in creative art. His preferment augurs well for his future in American Painting. One of Mr. Becker's paintings has been chosen to be hung in the International Exhibit of Watercolors, which opens shortly in Chicago."